This lovely, lazy Sunday marks one week post-marathon. The leaves are dropping, the days are getting shorter, and I’m getting my legs back under me. And even though I still have a few just-for-fun fall races on the horizon, I am starting to settle into the groove of easy running that marks the off-season. With my big race effort in the rear view, now is the perfect time to set goals and plan for the year ahead. The marathon gave me a good sense not only of where I am, fitness-wise, but also where I’m headed. I’ve always been a big believer in writing things down. Any goal, no matter how big or small, somehow becomes a little more attainable once I put pen to paper. I’ve kept some form of a journal since I was thirteen years old, and over the years I’ve found that most of my bigger questions are usually answered somewhere between the lines of all those mundane, day-to-day details. Writing down goals helps to point me in the right direction; journaling helps me stay on course. So I figure now is as good a time as any to start a proper training journal. There are a lot of great options out there if you’re in the market for a training journal. My roommate Ashley Comstock has had some pretty spectacular breakthroughs in her running this year. 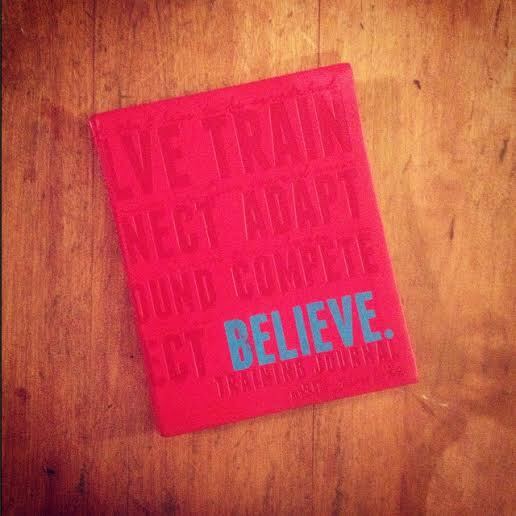 She loves the Believe training journal, created by two world-class runners (Lauren Fleshman and Roisin McGettigan-Dumas) to help other women chase after their athletic dreams. Me, I took a slightly less structured approach, and went the DIY-route with my training journal. 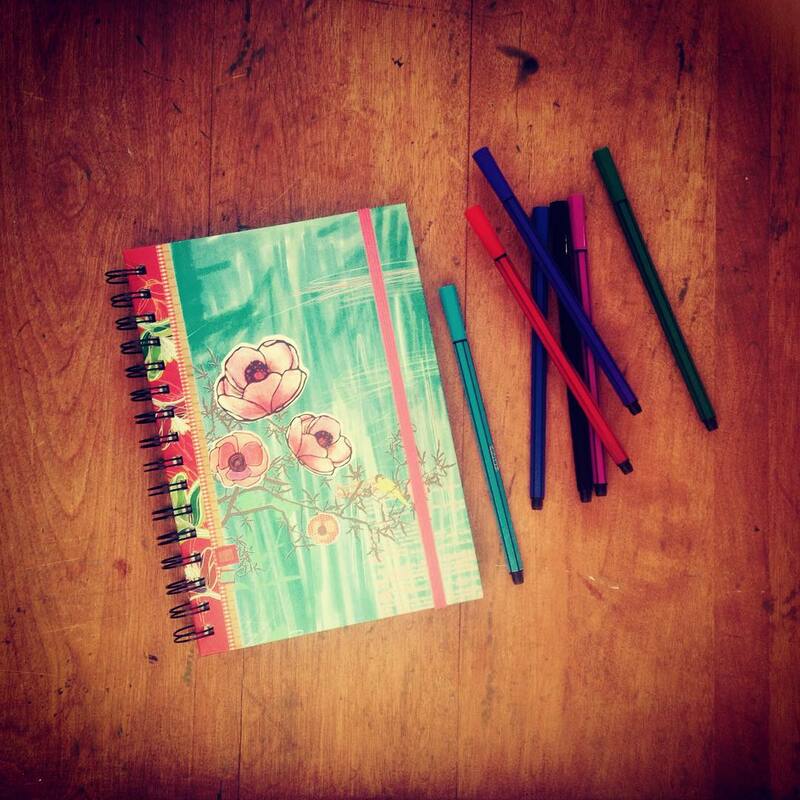 A spiral-bound notebook, some colourful pens, a few choice doodles and I’m ready to go! The appeal of a blank notebook for me is that I can chronicle my training in a more free-form fashion – with the added bonus that the whole setup only cost me three bucks! But whether you’re following a structured journal or just jotting down workouts on bits of scrap paper, there are a few key elements you should be sure to touch on. 1. Your long-term, ultimate goal. I broke my 2016 training into two phases, with several smaller racing goals within each phase. Some of the races I selected as serious challenges, while others were picked purely because they’re fun, or because I have friends who will be running them with me. In each phase, I tried to balance the serious with the fun, to avoid feeling too run-down. Plot all your races out on a calendar so that you can visualize the coming season. I would also add in any major events that might get in the way of training – things like holidays, weddings, moving, or anything else that might disrupt you usual routine. 4. A detailed weekly log. Yes, you want to record your workouts and mileage, but it’s also important to take stock of things like the weather, any injuries you’ve been dealing with, your mental state, the time of day or route that you ran, and whether you ran alone or with company. One of the things I learned from my previous training log is that I don’t do well on long runs with other people, but I seem to thrive when doing them solo. Journaling can help you to know yourself, and set you up for success when planning your weekly training. Let’s face it – running can be a grind sometimes. So I like to add in little bits of motivation to help me on the tougher days. Your training journal, like your training itself, should be personal and unique to you. Fill the pages with things that give you hope and help you to believe in yourself. And don’t be afraid to record your doubts and fears, too; when we put our anxieties into words, when we give our fears a name, we rob them of their power over us. Remember, running isn’t about being superhuman, but about how we persevere in the face of our own human frailty. So go ahead and put the whole story down on paper. I promise you, you’ll be glad you did.